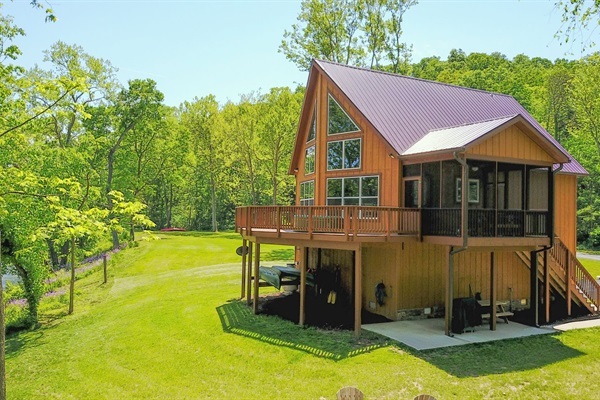 Nestled into a hill on the banks of the Shenandoah River, this cabin was purpose-built for river-side vacations. You can relax and chat with friends in the screened-in porch or roast marshmallows around the nearby fire pit while listening to the river in the background. Stacked, dried firewood is available for you to use for a small fee. Inside, you'll find a fully-equipped kitchen that flows into the dining area and living room complete with satellite and cable TV and gas fireplace. From the cozy living area, you have a wonderful view of the yard and river through the beautiful window wall. Rest up from a day of enjoying the great outdoors in one of the three comfortable bedrooms or in a chair on the large deck overlooking the river. The cabin also features wood flooring and trim, cathedral ceiling in the living area, and tile floors in the modern, fully-furnished bathrooms. Relax in our newly-added hot tub after a long day of hiking. Outside, there's a gas grill for grilling hamburgers, a huge open yard and - did we mention? - right smack on the river so you can wade right out or take the canoes out in complete privacy.